In many ways, an apple tree's metabolism is identical to that of other plants. Photosynthesis and cellular respiration occur just as they do in oak trees or daffodils. But some of the apple tree's metabolistic traits are characteristic specifically of fruit-bearing trees, unique to the way commercial growers graft and develop trees. These last are of particular interest to orchard farmers seeking to improve their yield. Animals need to eat in order get the complex organic compounds from which they derive energy and building blocks. This makes them heterotrophs, a word which means "other-feeding." Most plants, including apple trees, are autotrophs: "self-feeding." They don't eat. Instead, they create the sugars and starches they need from the inorganic substances in their environment. Plants collect energy and build glucose by means of a process called photosynthesis. A glucose molecule is made of three elements: carbon, hydrogen and oxygen. Plants get these elements from carbon dioxide and water. In order to break up these raw materials and recombine their components, they need a source of energy. That source is sunlight. 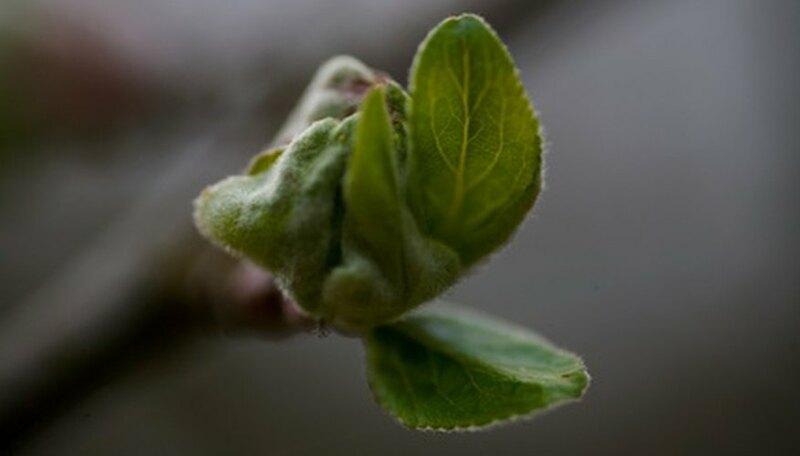 An apple tree's leaves contain a green pigment, chlorophyll, that traps sunlight and converts it into the energy that powers the chemical conversion of carbon dioxide and water into glucose and molecular oxygen. The apple tree uses the glucose created during photosynthesis to store energy for later use. This energy is later released in a series of small enzyme-controlled steps through a process called cellular respiration. This process happens in animals as well as in plants. An AMSCO School Publication describes cellular respiration as comprising two stages, the first being anaerobic and the second being aerobic. The anaerobic stage takes place inside the plant's cells, in the cytoplasm. There a series of fermentation reactions occur, splitting the glucose molecule in two. This process is known as glycolysis. It produces a small amount of energy, about four molecules of the chemical energy compound ATP. During the second, aerobic, stage, the two parts of the glucose molecule get taken completely apart in a process known as the Krebs cycle. An average of 36 ATP results. Though an apple tree creates its own sugars, it still requires other components to grow and blossom and fruit. Its roots take up nutrients from the soil. Orchard growers provide extra nutrients by fertilizing the soil. Nutrients fall into one of two categories depending on how much of each the tree needs. Those the tree needs in only trace amounts are micronutrients, while those the tree needs much more of are macronutrients. According to the University of Vermont, macronutrients for apple trees include nitrogen, phosphorus, potassium, calcium, sulfur and magnesium. Apple trees require the micronutrients iron, boron, manganese, zinc and copper. All of these are necessary; increasing the supply of one element will not make up for a deficiency of another. Orchard growers typically practice grafting. This means joining the upper part of a fruit producing cultivar, or scion, onto the rootstock of a different type or even species of tree. This practice allows fine-tuning of tree hardiness and fruit-bearing characteristics. No matter which rootstock the grower chooses, grafting results in slower tree metabolism. This is turn results in growth reduction. According to the International Potash Institute, this is probably because the grafting junction features a reduction in stem vessel area, limiting the rate of water and nutrient transport between root and canopy. Fungal microorganisms, or mycorrhizae, found in the soil surrounding the apple tree's roots have a mutually beneficial relationship with the tree. According to the International Potash Institute, the growth of the mycorrhizae extends the effective area of contact between root surface and soil, enhancing the tree's acquisition of water, potassium, zinc, copper and other nutrients.